The Simplicity Trapezoid Series is the perfect blend of design and craftsmanship, helping make superior corneal incisions. It features a blade with a unique top and bottom bevel design, which creates a self-sealing incision without having to applanate or "dimple down". 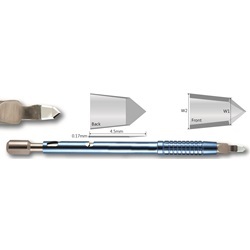 Four sharp sided, trapezoid shaped blades with two different blade widths allowing for a small or large incision. Handle is 100% titanium with J-locking mechanism and angled blade holder. 2.2mm width at front of blade (width 1) and 2.4mm width blade at back of blade (width 2). 2.5mm width at front of blade (width 1) and 2.8mm width blade at back of blade (width 2). 2.5mm width at front of blade (width 1) and 2.9mm width blade at back of blade (width 2). 2.5mm width at front of blade (width 1) and 3.5mm width blade at back of blade (width 2). 2.65mm width at front of blade (width 1) and 3.0mm width blade at back of blade (width 2). 2.7mm width at front of blade (width 1) and 3.2mm width blade at back of blade (width 2). 2.8mm width at front of blade (width 1) and 3.0mm width blade at back of blade (width 2). 2.8mm width at front of blade (width 1) and 3.2mm width blade at back of blade (width 2). 3.0mm width at front of blade (width 1) and 3.2mm width blade at back of blade (width 2). 3.0mm width at front of blade (width 1) and 3.5mm width blade at back of blade (width 2). 3.2mm width at front of blade (width 1) and 3.5mm width blade at back of blade (width 2).